“Logistics” is the integrated management of all the activities required to move products through the supply chain. Generally, “green logistics” focuses on seeking ways to manage the environmental footprint of the supply chain associated with your product, from point of manufacture through to the end user. This translates often to taking a life cycle approach to manufacturing and distributing your product (as well as reverse logistics in some cases). Transportation is a very key element of the logistics process and the supply chain which runs from vendors through to you to your customers. It involves the movement of product, service/speed and cost which are three of the five key issues of effective logistics. It also impacts with the other two logistics– movement of information and integration within and among suppliers, customers and carriers. The 2009 14th Annual 3PL Study found that newer concepts and technologies are emerging to help both 3PLs and shippers cope with a “new, slower growth world”. The report advocated creating “horizontal, cross-company supply chains refereed by neutral third parties. 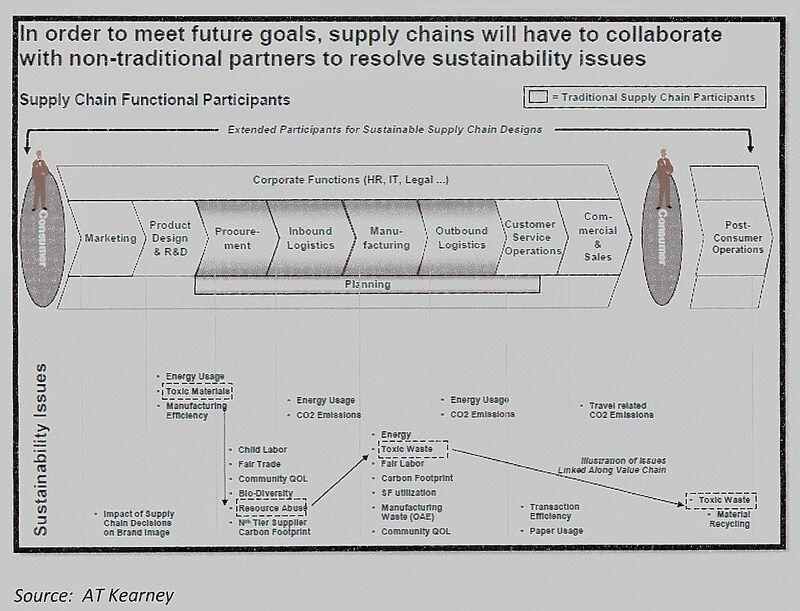 This innovation is based on the concept that by clustering specific logistics activities and consolidating supply chains, significant economies of scale can be achieved in terms of efficiency (logistics cost), effectiveness (customer service) and environmental sustainability (carbon footprint)”, and as noted below. From a logistics standpoint, 3PL providers might consider development of strategies to eliminate unnecessary materials handling or avoidable transport, and look for efficiencies that could move more product at a time. Trucking, rail, marine and air modes of transport all have their up and down sides and it’s best to look at point to point options that will result in lower energy/fuel costs, use of modes that use cleaner fuels (LNG, ultra low sulfur diesel), and generate fewer greenhouse gas emissions (use of larger ships that employ more efficient equipment or operational practices). Any number of “green” strategies to enhance the competitive position of freight-forwarding services are being implemented worldwide , including at key ports of entry here in the U.S. Most freight related environmental issues generally involve solutions to reduce energy consumption and limit greenhouse gas emissions. Naturally some carbon or energy intensive issues can be managed only if they are directly controlled by freight forwarding companies, while other activities not under direct control can only be influenced in practice (for instance contract carriers). Freightliner Trucks. Freightliner Trucks addressed the issue of fuel savings by focusing on more efficient aerodynamics. The aerodynamic features to the company’s Cascadia truck result in 7.8 percent to 22 percent less drag than other aerodynamic tractors, resulting in annual fuel savings of $900 to $2,750 per truck. Nortel: Nortel shifted from air to sea transportation to deliver significant cost reduction and took major adjustments in production planning and order scheduling to make it work For Nortel, the increased use of sea freight has saved more than $1,000,000 versus the more expensive air freight cost, as well as the opportunity to negotiate improved pricing that has realized approximately $500,000 of cost reduction. The 2009 14th Annual 3PL Study: This study found that shippers want to create more sustainable, environmentally conscious supply chains. That means striking a balance between labor and transportation costs and the market value of carbon-reducing processes, compressed production cycles and less carbon intensive transportation modes that beat the competition. It goes to say that a sustainability-focused 3PL strategy one innovative way to respond to the dynamics of your business, its customers, suppliers and operation through cost-effective, value added supply chain solutions.